Hello! Happy New Year's Eve everyone. I should probably be posting a more sparkly New Year's Eve nail look but I'm currently in London and I wanted to continue showing some of the polishes I showed in the December Nail Polish Haul post. So far I've showed the Essence Little X-Mas Factory polishes, the Barry M 2016 A/W Superdrug Exclusives, the Essence Colour of the Year in Jeans On! and the Barry M Jingle Bells polish. Phew! Not bad for someone who is usually dreadful at showing the polishes after I've done a haul post. Today's nails are the PS Nail Polish in Burnt Orange. I have a few PS Nail Polishes but haven't used them a lot. They are usually good though for picking up on trend colours and when I saw Burnt Orange I had to have it! 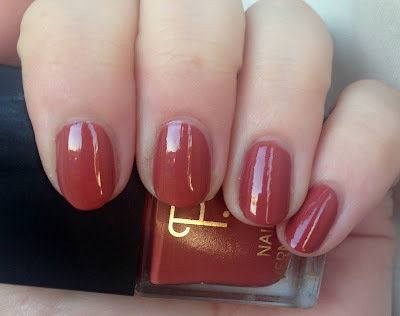 Yes, it's more of an autumn colour, the reason it drew my attention is because it reminded me of Essie's Playing Koi, as well as giving me the same kind of vibes as Essence's Colour of the Year My Love Diary. While I haven't got my hands on Playing Koi to compare them, I don't think they're going to be a dupe, but close enough. I probably won't be turning to this much now that autumn is over but it'll always be there for next year. Speaking of, I hope you have a great New Year's Eve and a Happy New Year to you!